PEARL, Miss. 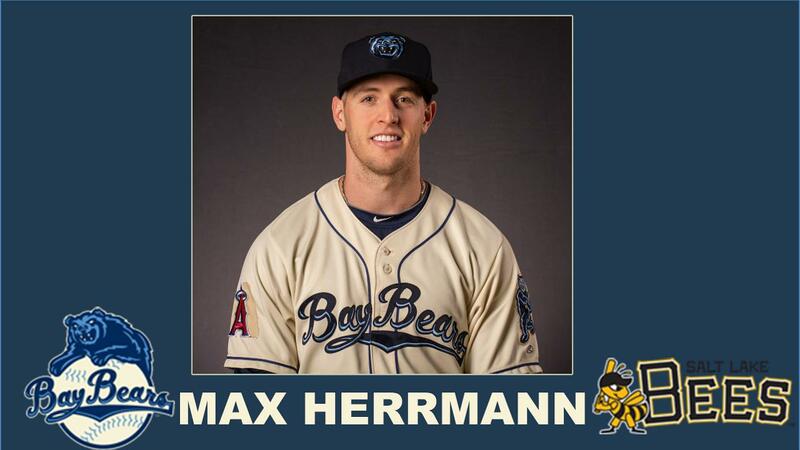 (April 14, 2019) - The Los Angeles Angels announced Sunday that left-handed pitcher Max Herrmann has been promoted from the Double-A Mobile BayBears to Triple-A Salt Lake. Herrmann, 25, appeared in two games with the BayBears over the past two seasons. In a start Sunday at Hank Aaron Stadium, he only allowed one unearned run on three hits in 4 1/3 innings against Pensacola. Herrmann faced the Blue Wahoos on the road last year in his Double-A debut on June 17, and he gave up just one hit in a scoreless inning of relief. In 42 professional games, 13 starts, Herrmann has a 4-10 record with a 5.25 ERA, 49 walks, and 87 strikeouts. He pitched in one Major League Spring Training game this year and tossed a scoreless, hitless eighth inning against the Padres on March 23. The Rutherford, New Jersey native was signed by the Angels on July 18, 2017, as a non-drafted free agent out of Rutgers University. This is the first time Herrmann has been promoted to Triple-A in his career. In a corresponding move, infielder Erick Salcedo has returned to Mobile from Salt Lake. Additionally, right-handed pitcher Zack Kelly has been transferred to Extended Spring Training, and right-handed pitcher Michael Santos is joining the BayBears from Extended Spring Training. The BayBears wrap up a five-game road series against the Mississippi Braves with a doubleheader Sunday, beginning at 1:05 p.m. Live coverage can be seen on MiLB.tv (Mississippi feed, subscription required, promo code: BAYBEARS) and heard on MobileBayBears.com, the TuneIn app, and the MiLB First Pitch app, with the Countdown to First Pitch starting at 12:45 p.m.